As you would have guessed, blogging has taken a back seat at the moment, due to my Dad's illness. We still haven't got M&D into a care facility yet, (but it's getting closer), so they have been staying with one of my sisters and our family has been their carers, making sure they have someone with them every day, taking them on outings or having visitors over and just being there for them. We are fortunate there are 6 of us girls and partners, so we are all juggling the caring, work, family life etc. It has been a lovely time though, of having quality time with M&D and catching up with aunty's, uncles and their friends. I thought I would share with you though this picture that came through on email yesterday as it's a classic and so practical. 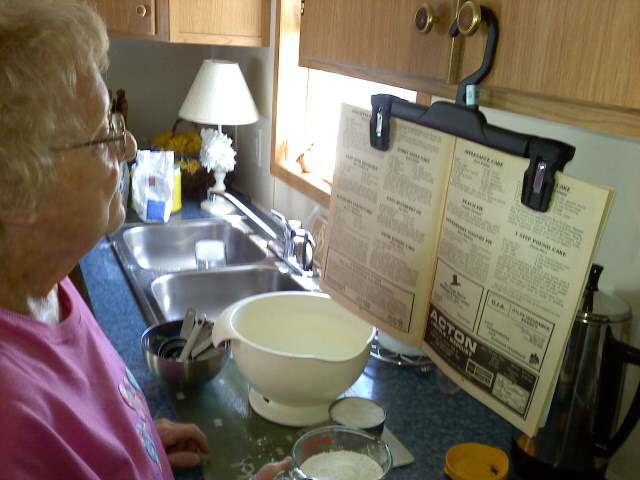 A recipe holder! Why didn't I think of that! When I was down in Adelaide the other week I took M&D out to Newman's Nursery at Tea Tree Gully for lunch. It was a lovely sunny day and after lunch we wandered around the nursery. It's so picturesque. The photo below shows their amazing magnolia trees, and Mum was beatifully colour coded amongst them!! They are such a cute couple, holding hands and what a good idea is that recipe holder? What a brilliantly simple idea..definitely going to try this one. Some times are more difficult than others but I think you are all doing wonderfully caring for your parents. It's not easy when parents get to an age when they need constant care, you are fortunate that you have a large family to share the responsibility. I only have mum now and she is an hour away, so my amazing sister (who doesn't have children and lives closer) is the main carer and we help out when we can. How clever is that recipe holder idea and so simple. That recipe holder is a cracker of an idea, so simple but so effective. We have been having some lovely weather lately, it would have been a nice outing at the nursery. Lovely to hear everyone is chipping in. The photo of your Mum and Dad is so lovely. The hanger is a fantastic idea. Enjoy those visits with family, lots of memories being made.